Resources on various native languages from the Americas, past and present, be it North America, Central America and the Caribbean or South America. Know of any other resources ? Feel free to add them. The basic version of this article is currently under construction and should be finished by the end of 2018. It will attempt to be a reasonably exhaustive (though not necessarily complete) overview of native languages from the New World. Native Languages of the Americas: American Indian Dictionaries and Language Books - “Preserving and promoting American Indian languages”. Many resources on the native languages of the Americas. Inwewinan - Native American Languages - Older site, with plenty of resources on the native languages of the Americas. Swadesh lists by family at Wiktionary - Includes many Native American and other native language families, with their individual Swadesh lists. Common Lakota Words - A dictionary from A to Z. With playable sample recordings for each word, serving as a pronunciation guide. New Lakota Dictionary Online - Offers both a desktop version and an online version. FirstVoices.com - Audio recordings of the First Peoples indigenous languages of Canada. The First Nations Languages of British Columbia - Especially useful for its bibliography lists on each of the featured languages. - Named after its two major dialects, Abenaki and Penobscot. Abenaki had an eastern and western dialect, the eastern one is extinct. - A relative of Cree. Beothuk language Beothuk terms Canada: Newfoundland - Extinct (in 1829). - Beothuk has never been classified while it was still in use, but it is generally assumed to be an Algonquian language. - Technically a dialect of Ojibwe/Ojibwa (see below). - Unclear classification within the Eastern Algonquian group, due to insufficient or confusing data. The language might not have existed, and might have been “created” by confusion with an existing Algonquian language or dialect by early European settlers who recorded it. - Two known sets of vocabulary survive, known as Loup A and Loup B. “Loup” was a generic term of French origin for the many related native nationalities and languages in New England. It is unclear whether the Loup A or Loup B vocab sets are fragments of a lost dialect, or of a local Algonquian creole, or a misinterpreation of existing terms from known tongues. Loup A might be the original language of the Nipmuc. Both Loup A and Loup B went extinct in the 18th century. - The language of the natives of Croatan island off the Carolina coast. They also developed a creole of Lumbee and English in later times. Extinct (by the 1790s). - Named after its two major dialects, Maliseet (Malecite, Malecites, Malisit) and Passamaquoddy. - Extinct, but undergoing a revival. - Creole language, developed from Cree and European languages (mainly French). The traditional dialect of the (Francophone) Métis. - Montagnais and Naskapi are Innu dialects, both close relatives of Cree. - Two major dialects, Munsee and Unami. - Technically a dialect of Ojibwe/Ojibwa. - Extinct (by the late 18th century). - Extinct (by the early 20th century). - Two major dialects, Munsee and Unami. Unami went extinct in 2002 (with its last fluent speaker), but there is a revival effort. Wiyot resources and audio recordings USA: California One of two small isolates of the Algic language family, all other Algic langs are in the Algonkian subgroup. Extinct, but some revival attempts. Yurok resources and audio recordings USA: northwestern California One of two small isolates of the Algic language family, all other Algic langs are in the Algonkian subgroup. Extinct, but undergoing a major revival. - Extinct (as of 2016), but there is a revitalisation project. Chemakum language (Chimakum or Chimacum) N/A USA: Olympic Peninsula, Washington - Previously thought to be a language isolate, but now in the tiny Chimakuan language family, along with Quileute. - Extinct (by the 1940s). Quileute language (Quillayute) Quileute terms USA: Olympic Peninsula, Washington - Previously thought to be a language isolate, but now in the tiny Chimakuan language family, along with Chemakum/Chimakum. - Extinct (by 1999), but there is a revival project. - Had a dialect, Samala (Sʰamala, Ineseño). - Extinct (by 1965), there are some revival efforts. - Extinct. Little is known about the Interior Chumash languages. - Extinct. Little is known about the Interior Chumash languages. Emigdiano seems to have been a variety or dialect of Barbareño, and influenced by the neighbouring non-Chumashan language Buena Vista Yokuts. - Two main dialect subgroups: Western-Central Aleut (Atkan, Attuan, Unangan, Bering) and Eastern Aleut (Unalaskan, Pribilof). Attuan is extinct. - Three major dialects: Kalaallisut (West Greenlandic), Tunumiit oraasiat (East Greenlandic) and Inuktun (Avanersuaq, Polar Eskimo). - Two major dialects: Qawiaraq (Seward Peninsula Inupiaq) and Inupiatun or Northern Alaska Inupiaq (the latter includes Uummarmiutun, Canadian Iñupiaq). - Three major dialects: Natsilik (Natsilingmiutut, Netsilik, Nattiliŋmiutut) (Nunavut), Siglitun (NWT) and Inuinnaqtun (NWT, Nunavut). The last one is speculated by some to be closely related to Inuktitut dialects too. - Extinct (as of 1997). - Has four major dialects: Lower Copper River dialect, Central Copper River dialect, Western Ahtna dialect and the Upper Ahtna dialect. - Eastern Apache includes the Jicarilla (Abáachi mizaa) dialect and the extinct Lipan dialect. - Apache proper has two major subdivisions, Western and Eastern, with many regional dialects. Major offshoot dialects are Mescalero and Chiricahua (see further below), while minor dialects of Western Apache proper include Tonto, White Mountain, San Carlos and Cibecue. - Extinct (since the 1960s). Related to Wailaki (Eel River) language. - Also includes the Yellowknife Dené dialect of the Yellowknife/Copper tribe (T'satsąot'ınę). - Seven dialects, with high and low tone characteristics: Boyer River, Child Lake, Prophet River, Blueberry River, Doig River (high tone), Halfway River, West Moberly Lake (low tone). - Generally classified in its own group within the Na-Dené languages. Along with Haida and Tlingit, it is not within the family's Athabascan group. - Possible relatively of Tututni (see below). Extinct after the 19th century, few surviving records. - Generally classified in its own group within the Na-Dené languages. Along with Eyak and Tlingit, it is not within the family's Athabascan group. The relation of Haida to other Na-Dene languages is disputed, it might even be a partial isolate. - Currently the only surviving living language of the Californian group. - Relatives include Eastern Apache and the extinct Lipan. - Extinct (by the early 1930s). Had two major dialects: Kwalhioqua (with subdialects) and Clatskanie. - Extinct. Relatives include Eastern Apache and Jicarilla. - Extinct (since the 1930s). - Relatives include Western Apache and Navajo. - Possibly the largest Native American language in North America today, by number of speakers (ca 150 000). Closely related to both Western and Eastern Apache. - Extinct. Possibly a dialect of Chilcotin. - Forms a subgroup of its own in the Apachean group. Extinct as a living language, might see revitalisation. Sometimes called Kiowa-Apache, but this is a misleading term, as it has no relation to the language of the Kiowa. - A relative of Tanana (see below). - Generally classified in its own group within the Na-Dené languages. Along with Eyak and Haida, it is not within the family's Athabascan group. - Chetco is a variant of the language. It's often called Chetco-Tolowa. - Extinct (in the early 1980s), but there is a revival project. Major dialects include: Coquille, Tututni (proper), Euchre Creek and Chasta Costa. - Extinct in the 1950s. - Extinct. Its dialects were those of the Sinkyone, Wailaki, Nongatl, and Lassik tribes. - Few current native speakers. Adaizan numbers USA: northwestern Louisiana - Language isolate. - Also known as Adaizan, Adaizi, Adaise, Adahi, Adaes, Adees, Atayos. Cayuse language N/A USA: Oregon - Language isolate. Some have speculated it might belong to or be a relative of the Caddoan languages (Pawnee, Caddo, etc.). Chimariko resources and audio recordings USA: California Probable language isolate, some put it under the hypothetical "Hokan" language family. Chitimacha language Chitimacha (Čitimaaša) terms USA: southern Oklahoma - Language isolate. Some have proposed a relation to the hypothetical Totozoquean languages family. - Extinct (since the 1940s). Esselen resources and audio recordings USA: northern California Probable language isolate, some put it under the hypothetical "Hokan" language family. USA: Prince of Wales Island, Alaska Generally classified in its own group within the Na-Dené languages. Along with Eyak and Tlingit, it is not within the family's Athabascan group. The relation of Haida to other Na-Dene languages is disputed, it might even be a partial isolate. Karankawa language Karankawa terms USA: coastal Texas (Galveston Island to Corpus Christi) - Unclassified, possibly an isolate. - Extinct (in 1858), before classification could be undertaken. Keres language Keres terms USA: New Mexico - Language isolate. USA: Montana, Idaho - Language isolate. Natchez language Natchez terms USA: Mississippi, Louisiana, Oklahoma - Language isolate. - Extinct in the 1950s, ongoing revival attempt by the early 2010s. Salinan resources and audio recordings USA: central coast California - Extinct. Two known dialects, Antoniaño and Migueleño. - Language isolate, probably. In the past, speculated to be part of a Salinan-Seri languages group in the hypothetical "Hokan" language family, but this has not been confirmed. Timucua N/A USA: northeast and north central Florida, southeast Georgia - Language isolate. - Speculated by some researchers to be a distant relative of Muskogean, Arawakan and other language families, but none of this has been confirmed to date. Tonkawa language USA: western Oklahoma, south-central Texas, New Mexico - Language isolate. Tunica language Tunica numbers USA: central and lower Mississippi valley, central Louisiana - Language isolate. - Extinct (since the late 1940s), but there is a successful revitalisation effort. Washo resources and audio recordings USA: California, Nevada - Language isolate, some put it under the hypothetical "Hokan" language family. - Endangered, but with revitalisation efforts. Yana (Yahi) resources and audio recordings USA: northern and north-central California - Language isolate, some put it under the hypothetical "Hokan" language family. - Extinct. Had four dialects: Northern Yana, Central Yana, Southern Yana and Yahi. A famous native Californian speaker of Yahi was Ishi, with whom the dialect died out in 1916. Yuchi language Yuchi terms USA: east central Oklahoma - Language isolate. Zuni language Zuni terms USA: Arizona, New Mexico - Language isolate. - Extinct (since late 1980s). - Karok's closest related languages are Shasta and Chimariko. It is often classified as a member of the hypothetical "Hokan" language family's Karuk-Shasta group. Shasta resources and audio recordings USA: northern California - Shastan languages subgroup. Shasta's closest related languages are Karuk and Chimariko. Often classified as a member of the hypothetical "Hokan" language family's Karuk-Shasta group. - Extinct (by the end of the 20th century). - Several dialects or sublanguages: Piro (Piro Pueblo, New Mexico, extinct by the early 1900s), Taos (Taos Pueblo, New Mexico), Picuris (Picuris Pueblo, New Mexico), Southern Tiwa (Isleta Pueblo in New Mexico, Ysleta del Sur near El Paso, Texas), et al. - Unique for not having any written form, as tribal rules forbid the practice. - The only Muskogean language (i.e. not dialect) known to be extinct (during the early 18th century). - Two dialects, Yaquina and Alsea, both extinct in the 20th century. - Extinct at some unknown date. Dialects: Clatsop (Tlatsop), Shoalwater Bay dialect (Shoalwater, Chinook proper) and Chinook Jargon (see below). - Extinct (by 2012), but there are revival efforts since the 2000s. Several dialects, all extinct: Watlalla (Watlala, Cascades Chinook dialect), Hood River dialect, White Salmon dialect, Wasco-Wishram dialect, Clackamas, Multnomah (Sauvie Island dialect), and the not mutually intelligible Kathlamet (Katlamat, Cathlamet). - Trade pidgin, developed from Chinook, English, French and the Nootka (Nuu-Chah-Nulth) language (from the Wakashan language family). - Two dialects, Hanis and Miluk, both extinct in the 20th century. - Extinct (by the 1930s). - Extinct as a first language since 2007, but there's an ongoing revival with hundreds of new speakers. Currently the only extant language of the Maiduan subgroup. - Extinct as a first language, but there's a smaller revival, including detailed documentation. - Several major dialects: Tenino (Warm Springs dialect, Celilo), Umatilla (Tamalúut), Walla Walla and Yakama (Yakima, Klickitat). - Two dialects, Siuslaw and Kuitsh. - The extant dialect of the two dialects of the Tsimshian language, the other being the recently extinct Southern Tsimshian (Sgüüx̣s, Ski:xs). - The extinct dialect of the two dialects of the Tsimshian language, the other being the extant Coast Tsimshian (Sm'algyax). - One of the two dialects of the Nass–Gitksan group, both extant. Also known as Gitxsanimaax, Gitksan, Giatikshan, Gityskyan, Giklsan. - Extinct (by 2016), but there is a transcription project since the early 2010s. Might be followed up by a revival. - One of only three currently extant Pomo languages, the other being Southeastern Pomo and Southern Pomo. - Ongoing revival in the early 2010s. One of only three currently extant Pomo languages, the other being Kashaya (Southwestern Pomo) and Southern Pomo. - Extinct (almost no speakers remain as of the early 2010s), though still considered extant, along with Southeastern Pomo and Kashaya (Southwestern Pomo). - Extinct (by 1990). Close to Upper Chehalis (see below). There is no Upper Cowlitz language, as the Upper Cowlitz tribe spoke a different language altogether. - Extinct at some point in history, exact date unknown. - Also known as xʷəlšucid, dxʷləšúcid, Puget Salish, Puget Sound Salish or Skagit-Nisqually. - Extinct (in the late 1980s), the revival project had its first new fluent speaker by 2010. - Extinct (by 1940), an though documented by Franz Boas, there is little research bibliography. - Extinct at some point in the 20th century. A few native speakers still know some vocabulary. - Extinct (since the 1970s), Tillamok community members and researchers have created a 120 page dictionary. - Extinct (by 2001). Placed more closely to Cowlitz. - Extinct (in the 1930s). - Extinct (by the early 1960s), but there is a revival effort. - Extinct (by 1996), with a revival effort. Its closest relative Ho-Chunk (Winnebago) is still spoken. - Ho-Chunk (Winnebago) is still extant, though with a smaller number of speakers, but its closest relative Chiwere (see above) is extinct. - Extinct (by 1983), but there is a revival effort. - Extinct as a first language very recently (2016), but there is an ongoing revival effort to generate new fluent speakers. - Extinct at some point in the late 17th century, possibly due to tribal warfare. Seems to be a relative of Biloxi. - Extinct (by 2005), but there is a revival effort. A new alphabet standard for the language (based on the Latin script) was devised in 2006 and is now available in Unicode. - Only major group of Siouan speakers wholly in Canadian territory. - Extinct by the early 18th century. Only a small vocabulary of some 143 words survives, recorded in a printed publication from 1709. A factor in the language's early extinction was the conquest and assimilation of the Woccon by the Tuscarora. - The Heiltsuk-Oowekyala language is divided into the Heiltsuk dialect (Haíɫzaqv, Bella Bella and Haihais) and the Oowekyala dialect (Ooweekeeno, Wuikyala). - Extinct in 2002, but survives as a second language and is undergoing a revival. - Extinct at some point, but there is a partial speaker in the 2010s. - Extinct by around 2003, but there is a revival effort. This is the only currently extant Wintuan language. Three main dialects: River Patwin (Sacramento River, Colusa County), Hill Patwin (hills and plains in the lang's western range) and Southern Patwin (rather poorly documented). - Extinct by around 2003, but there is a revival effort in progress since 2011. Wappo language (Ashochimi) Wappo terms USA: Alexander Valley, California - Extinct (by 1990). - Initially thought to be a language isolate, it was placed along with Yuki into the Yuki-Wappo language family, due to them being distantly related. Yuki language (Ukiah, Ukomno'm) Yuki terms USA: Eel River area, California - Extinct (in the 20th century). - Initially thought to be a language isolate, it was placed along with Wappo into the Yuki-Wappo language family, due to them being distantly related. - Two dialects, Havasupai and Hualapai (Walapai), spoken by the eponymous two tribes. Sometimes referred to collectivelly as the Pai language. - Not to be confused with the Quechua languages of South America. 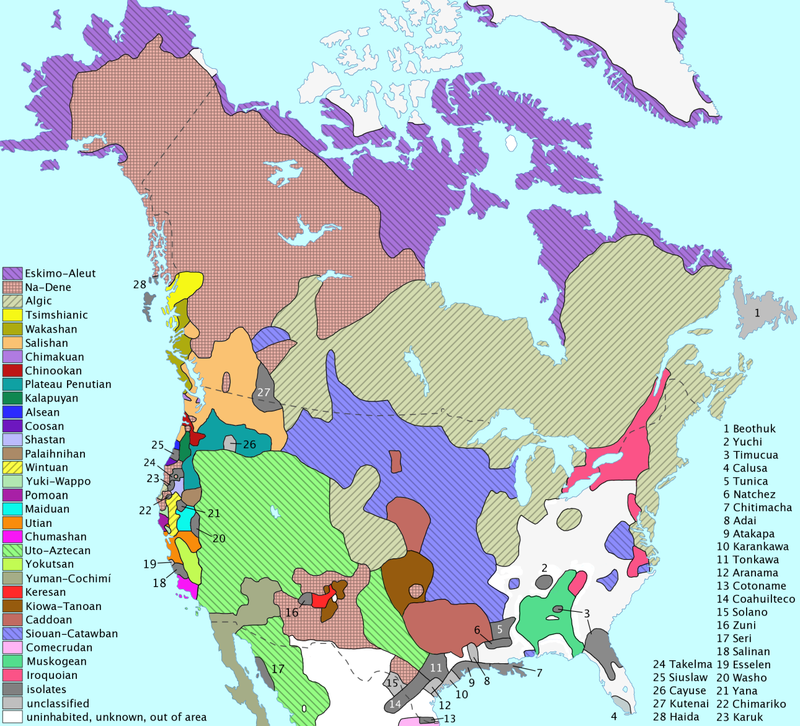 To date, the classification of some North American native language families has not been entirely closed. This counts especially for some of the native languages of the western and southern United States, and western Canada. Some language families, such as Hokan, Penutian, “Gulf” and others are currently considered “hypothetical” or “proposed” by the professional linguistic community. The language overviews provided in the table above reflect this unresolved nature of the research. For example: Some language branches speculated to fit under Hokan are listed separately here, and the individual languages speculated to fit under Hokan are listed as language isolates. However, each of these entries includes a note that they are hypothesised to belong under “Hokan”. Whether Hokan is a concise interrelated language family still remains controversial among linguists, even after many decades of research, and our decision is to not present it as a language family until the issues are fully cleared up. The “Penutian” language family is generally approached as less theoretically nebulous (when compared with Hokan), and though it has undergone revisions, is listed as a substantial language family (for simplicity's sake). The classification used for the Penutian family in this overview is based on the latest classification revision by Scott DeLancey (bear in mind there can be minor variations to this system, depending on the linguist). The “Gulf” languages are listed as isolates for now, as their relation to the proposed language family is still undergoing research and revision. English to Mayan (Yucatec) - A dictionary. The Dictionary of the Taino language - Reliable, but may include a few goofs. The following table lists links to articles on Central American and Caribbean native languages at Omniglot.com and Native-languages.org, including lists with useful phrases, downloadable materials and further useful and relevant links. Seri language resources Sonora, Mexico Language isolate, probably. In the past, speculated to be part of a Salinan-Seri languages group in the hypothetical “Hokan” language family, but this has not been confirmed. Highland Oaxaca Chontal audio recordings (from this sound archive) Mexico: Oaxaca state Extant. Huamelultec (Huamelula Chontal, Lowland Oaxaca Chontal) N/A Mexico: Oaxaca state Extant. Tequistlatec language N/A Mexico: Oaxaca state Extinct. Kiliwa language Kiliwa language resources Mexico: northern Baja California - Its own group within the Yuman languages. - Very marginal, only 4 native speakers left as of 2018. The following table lists links to articles on South American native languages at Omniglot.com, including lists with useful phrases, downloadable materials and further useful and relevant links. Chile Isolate (though some have tried to find similarities to other New World languages). Natives - Useful resources on native cultures around the world, including Native American cultures. Points of Divergence: Native Americans - A collection of PODs focusing on Native American cultures.